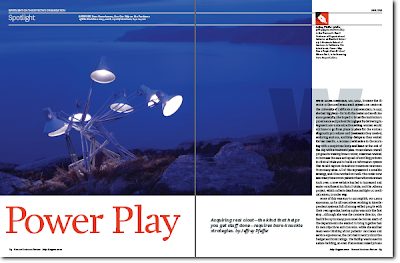 From the July-August 2010 issue of HBR, comes this column by management professor Jeffrey Pfeffer - "Power Play". The article is written by Prof Jeffrey Pfeffer, Thomas D. Dee II Professor of Organizational Behavior at the Graduate School of Business, Stanford University, and well-known collaborator with Prof Bob Sutton. It is about acquiring power to get things done in an organization. Especially in environments as characterized by the case of Laura Esserman, who managed to increase the speed with which cancer patients were treated as well as the size of the Carol Franc Buck Breast Care Center at the University of California at San Francisco, where she became its director in 1997 (Chip and Dan Heath also write about this in their book, "Switch: How to Change Things When Change Is Hard "). In sum, Esserman was in a position similar to that of anyone who has tried to shepherd a cross-functional project, such as a new information system or product offering, through a large organization: She had lots of responsibility but virtually no line authority to compel anyone to do anything. The words "power" and "politics" go together. Neither is seen in a very laudatory light. As the organizational behavior expert Jo Silvester writes, politics is generally regarded as the “dark side” of workplace behavior. ... A perception that politics predominates in a workplace tends to decrease job satisfaction, morale, and commitment and increase intentions to quit. Yet, being politically savvy can pay rich dividends. Unfortunately for some. But empirical research shows just as clearly that being politically savvy and seeking power pay off. You can be interested in being liked at the workplace. You can focus on your work and actually get things done - achievements. Or you can focus on accumulating power. Bingo!!! That's what will evidently make you successful. So this begs the question - if these skills are important, why don't people develop them? Saying it is distasteful may silence your inner moral compass' voice, but this moral high ground not going to win you any points within your organization. So what can one do to accumulate and exercise power meaningfully? The article lists such strategies as being in a position to hand out resources (the managers who will hoard information, or act as bottlenecks to organizational resources), being proactive, making progress on multiple fronts, shaping behavior through rewards (and punishments) - or using the carrot and stick approach - or even the Godfather strategy - "I'm going to make him an offer he can't refuse - Wikipedia, the free encyclopedia". A very crucial suggestion is "Don’t draw unnecessary fire". It calls on the ability to keep sight of the bigger picture, and to not get distracted by issues that are not relevant to the end. The ability to focus. The point of the small battles one has to fight is not the battle itself. People who effectively wield influence make it clear that you will get rewards if you help them and problems if you don’t. 1. The Belief That the World's A Just Place - believing the "just-world" hypothesis can harm you in at least two ways. He argued that people want to think the world is predictable and comprehensible and therefore potentially controllable. Once they happily persuade themselves of that, they embrace the corollary: If they do a good job and behave appropriately, things will take care of themselves. First, it limits their willingness to learn from all situations and all people, even those they don’t like or respect. Second, it anesthetizes them to the need to proactively build a power-base. 2. Leadership Literature. Academics can often inflict more harm than good. The teaching on leadership is filled with prescriptions about following your inner compass, being truthful, letting your feelings show, being modest and self-effacing, not behaving in bullying or abusive ways—in short, prescriptions that reflect how people wish those in positions of power behaved. So anxious are people to preserve their self-esteem, and therefore so eager to protect themselves from the psychological damage that failure can inflict on their egos, that people will often deliberately kneecap themselves. A phenomenon known as "self-handicapping" comes into play - where people intentionally diminish their performance, thereby producing an explanation for failure - "I didn't study hard enough; otherwise I could have done a lot better." or "This is great, considering I hardly put in any effort into the exam." Nice. A very timely, useful, and what I would call bold article. Makes me want to go and read more of what Prof Pfeffer has written. Self-handicapping is described as an action or choice which prevents a person from being responsible for failure. It was first theorized by Edward E. Jones and Steven Berglas, according to whom self-handicaps are obstacles created, or claimed, by the individual in anticipation of failing performance. Self-handicapping behaviour allows individuals to externalise failures but internalise success; accepting credit for achievements, but allowing excuses for failings. Self-handicapping can be seen as a method of preserving self-esteem but it can also be used for self-enhancement. People may self-handicap to manage the impressions of others, or of themselves (though studies have been unable to test the latter). An example of an individual self-handicapping is the student with an impending important exam who spends the night before at an all-night party rather than studying. The student fears failing their exam and appearing incapable. In partying the night before their exam the student has engaged in self-defeating behaviour and increased the likelihood of poor exam performance. However, in the event of failure, the student can offer fatigue and a hangover, rather than lack of ability, as plausible explanations. Furthermore, should the student receive positive feedback about their exam, their achievement is enhanced by the fact that they succeeded, despite the handicap. Researchers on self-handicapping have distinguished between claimed self-handicaps, in which the individual merely states that an obstacle to performance exists, and behavioral handicaps, in which the individual actually creates obstacles to performance. Examples of behavioural handicaps include alcohol consumption, the selection of unattainable goals, or lack of practice . Examples of claimed self-handicaps include declarations that one is very anxious  or that one is experiencing various physical and psychological symptoms. The Wikipedia page cites an external link, Mind - Some Protect the Ego by Working on Their Excuses Early - NYTimes.com, where it emerges that it's best if you don't do the whineing, but get an apologist on your behalf. Interesting. To put it in plainer words - "the world ain't fair. Get over it."